for being accomplice to armed robbery. You can call me Johnny B. Nice. The speaker in this irreverent piece goes on to invoke Thelonious Monk and Janis Joplin. I was in high school. This was my first encounter with Juan Felipe Herrera. Two years later I joined the staff of the Berkeley Poetry Review (BPR) as a college sophomore. Reviewing submissions one day in the BPR’s campus office, I opened an envelope stuffed with Herrera’s poems—two would soon grace our pages. After the issue came out, we asked him to read in a series we held on the grounds of the Berkeley Art Museum on Sunday afternoons—the Swallow Café. He graciously agreed. And yet I can’t paint with precision the particulars of our first meeting. Instead, I remember sitting in a metal folding chair in San Francisco, mesmerized by the performance he was giving at Small Press Traffic, a modest storefront on the corner of 24th and Guerrero—five-minutes on foot from the house I grew up in. Once, I sat in a café on 24th, below Mission just off Capp, sipping coffee and chatting with Herrera and Margarita Luna Robles. We’d gotten to know each other some, and we had a mutual friend: Francisco X. Alarcón. I remember buying Arte Público Press’ 1985 edition of Exiles of Desire, a collection whose first iteration had came out in 1983 with Lalo Press. Herrera did not pay a reading fee to enter a book contest. He got his start by publishing in, and for, his immediate community—a model I’m partial to. I remember devouring Exiles of Desire, but not only for its art. It was a book rooted, in good measure, in a geography that I considered mine: San Francisco’s Mission District—its cafés, BART stations, murals, street names: 16th, 24th, Valencia, Bartlett, Capp, Harrison. But there’s more. These were the Reagan years, and you knew it because some of the poems didn’t shy away from one of the pressing issues of that era: U.S. foreign policy in Central America. As a Latino of Nicaraguan descent who kept up with these things, I viewed Herrera as an early model on how one’s art need not be divorced from politics. I am dressed for the occasion. the plateaus where the night watchman lives. and the ravenous soldiers I break bread with. guide me into the multi-night. I remember loving that last line, but lacking a tidy logic with which to express why. Herrera was that kind of writer for me: he was just fun to read. The term “non sequitur” wasn’t in my vocabulary then, so I wouldn’t have identified his brilliant use of non sequiturs here. I suspect my ear intuitively took in the subtle assonant rhymes that spilled from one stanza to the next—the sounds echoing, gluing the words, this wordscape, into place. “Inferno St.” was one of the 10 poems from Facegames that were included in, Half of the World in Light: New and Selected Poems (University of Arizona Press, 2008), winner of the National Book Critics Circle Award. I do it best when I get dressed up. See my camouflage pants rolled up to the calf? and a so-what all over your Brown self! 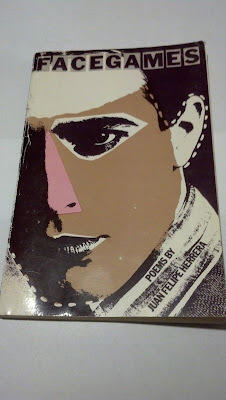 In 1989 a Santa Cruz-based publisher, Alcatraz Editions, put out AKRILICA, Juan Felipe Herrera’s dazzling dual-language collection: the poems, written in Spanish, were translated into English by a team of four translators, along with the author. Over 20 years later, Carmen Giménez Smith and I would form a partnership between Noemi Press and Letras Latinas. We’d seek to publish Latino/a writers whose aesthetic proclivities were more, shall we say, outside the box—defying expectation. When it came to deciding what to call this series, we thought about the poetry, and we thought about the trajectory…of Juan Felipe Herrera. Then we remembered that singular, collaborative, small press obra maestra: AKRILICA. And so we had the name (as homage) for our joint publishing project. I continued, of course, to follow Herrera's work post-AKRILICA, admiring its ambition, its scope, its wild variety. But I have a soft spot for these early volumes. I suspect it has mostly to do with when I encountered them, those formative years. I want to rock in Tede Matthews's America and his Hula Palace—remember Tede Matthew's? Ted out-gay talking about Nicaragua, doing the reading series at Modern Times? Ted working hard through AIDS, through pain and the end, with gaunt face, febrile fingers, and starry eyes? Ted's drawn face calls and his clear eyes peer through me. Battles, missions, random intersections, chaos, time and culture boosters, explosions; I want writing to contain all this because we contain all this—is this closer to what you mean by saying we are Americanos? Is this your mission? You know, Victor, I am going to say it—no more movements, nothing about lines or metaphors or even about quality and craft, you know what I mean? When the terms “San Francisco” and “bookstore” and “poetry” mingle in a conversation, inevitably someone will mention that mecca known as City Lights. I love the “poetry room” at the famed North Beach bookstore as much as anyone, but my personal mecca was Modern Times Bookstore on Valencia in the Mission. During high school and college (when I was home for a visit from UC Berkeley across the bay), I always anticipated the end of my fifteen-minute stroll to Modern Times—the browsing, the pulling poetry off the shelf to read, the putting it back, before walking back to my house on Fair Oaks maybe one, two hours later. I remember the time I purchased Ernesto Cardenal in English translation (I couldn’t yet read Spanish). Tede Matthews was often the familiar friendly face I encountered at Modern Times. I had no idea who he was and what he represented. Francisco X. Alarcón would explain it to me years later. Juan Felipe Herrera would include a substantive gloss of him in his moving short essay, “Chicano Gay Poets,” published on the web at FoundSF—a community-based online resource (“Your place to discover & shape San Francisco history”). 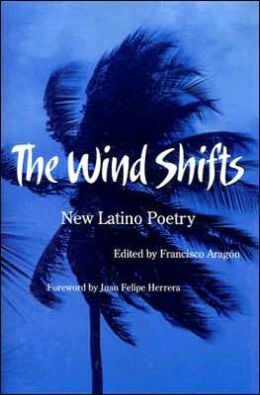 When it came time, in 2006, to ask someone to write the Foreword to, The Wind Shifts: New Latino Poetry (University of Arizona Press, 2007), who else could I ask but him? 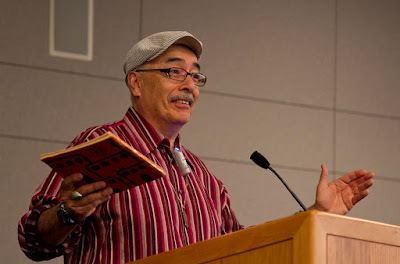 Since the appearance of Rebozos of Love (Tolteca Publications, 1974), Juan Felipe Herrera, author of some twenty books, has distinguished himself as a poet, performance artist, children’s book author, teacher, university professor, and cultural activist for the last forty years. While his more recent distinctions include the aforementioned National Book Critics Circle Award (2009), a Guggenheim Fellowship (2010), election to the Academy of American Poets’ Board of Chancellors (2011), and designation as the Poet Laureate of California (2012), I would argue that during the first twenty or so years of his literary activity, he pretty much glided under the radar, where recognition outside of California is concerned. It’s only been in the last ten or so years that his work has gained the national critical attention and acclaim it justly merits. What thoughts swirl inside of me as I ponder that Juan Felipe Herrera has been named the next Poet Laureate of the United States? In addition to the playfulness I’ve alluded to earlier, his is also a poetics of deep empathy toward the people that populate his writings. 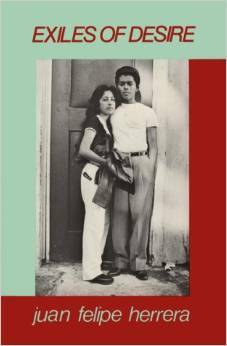 And to quote Rigoberto González from his Poetry Foundation blog post, Juan Felipe Herrera’s oeuvre also offers, crucially, “an important timeline of Chicano political history and social activism” in this country. His persona embodies an exuberance that will, I predict, enrich and delight the men, women and children he will come into contact with during his term (s). I don’t think I speak for myself only when I say that his selection is a long overdue gesture that acknowledges artistic communities that are often overlooked by oblivious gatekeepers. In this sense, his U.S. Poet Laureateship, like no other in my view, feels, fully, like the People’s Poet Laureateship. 1. In 1990, early into my ten-year residence in Spain, I learned that the late Oscar Hijuelos had won the Pulitzer Prize. I immediately went to Madrid’s English language bookshop and purchased, The Mambo Kings Play Songs of Love. Reading it, I was transfixed by the way Hijuelos captured particular registers—modes of speaking—of his urban characters. They sounded like people I knew growing up. My heart swelled. 2. Two years later, in 1993, what I remember most about the news accounts of Toni Morrison winning the Nobel Prize for Literature, was the tenor, not the contents, of the comments made by Henry Louis Gates, Jr. I came away with, and was moved by, a deep sense that for Gates, an African American scholar, Toni Morrison’s Nobel was one of the highlights not only of his career, but of recent African American history. In other words, Morrison’s Nobel was something larger than herself. Juan Felipe Herrera's work is an inspiration for all Latinos in this country. The beauty and the power of his poetry match his commitment to our community.